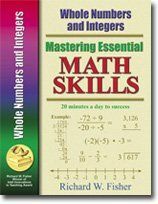 Family Style School: Math Essentials~ Read This! Last year my son took traditional textbook Pre-Algebra. After struggling through that. I had strong feelings that this year he would need to repeat it. I would much rather him have a strong foundation, and if that takes longer so be it. Then, I was sent to Math Essentials to review. We received the Pre-Algebra Skills book as well as the Whole Numbers and Integers book. Each day Tommy has completing a lesson in the Pre Algebra Book. Which takes in total about 20 minutes. Who would have thought that math didn’t need to take an hour each day. You begin by watching the video tutor and taking notes and then completing a few review exercises. There is a helpful hints section, followed by problems that use the skill you just learned. The 2 first problems are known as sample problems and you do them with a teacher/parent watching you. Once you’ve got those right you move on the complete the remaining 10 problems alone, with a story problem at the end. This has been such a great way for him to understand the skills that build up to algebra. I have seen him get every answer correct the first time in these lessons. Which was rare with the textbook style approach he was using last year. I know he has felt less overwhelmed by math as well as his confidence in math has soared! These things are all thanks to Math Essentials. Now that I have gushed and gushed about how much this book has helped us, let me share with you the table of contents and what your student will learn using this. Here are some sample pages as well. This curriculum would work well for a stand alone curriculum as well as a tutor for a struggling learner. Of course I think it works really great for a way of re-teaching pre-algebra skills as well. Another really great thing about this curriculum is the price. The next book we received is Whole Numbers and Integers. This book is set up in the very same way without the DVD. This book teaches concepts such as upper level addition, subtraction, multiplication, dividing, estimating, with whole numbers as well as with integers. This book is also priced right. 10 or more copies $10.95 ea. This book covers all four operations for both whole numbers and integers. Also included are plenty of practical, real-life problem solving situations. View the Table of Contents as well as some sample pages. Math Essentials offer many levels of math. Check them all out here. I will definitely be purchasing No Nonsense Algebra to begin next year. Which includes online video access along with the book for just $27.95. We reviewed No nonsense algebra and I LOVED it!